29 March 2014 – Portoroz, Slovenia. Second day of the Melges 24 European Sailing Series regatta in Portoroz has been dominated by light winds. 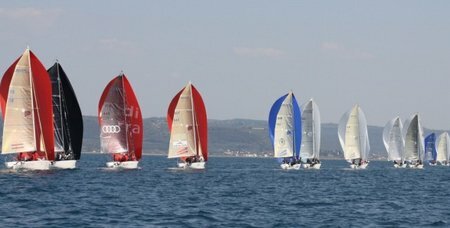 Slowly but surely, the sea breeze started appearing in the bay of Piran around noon providing the fleet of 24 monotypes another great day of racing. The race committee left the harbour according to the schedule with the intention to make the most of the day. Therefore, as soon as the wind from the west increased from four to seven knots, the show was on. The first race entirely belonged to Croatian Tomislav Basic’, who led the pack from start to the finish with a considerable advantage. Storm Capital Sail Racing (NOR) delivered a fantastic performance as well and was rewarded with a second place, while Altea (ITA) placed fifth but managed to maintain the lead. “We had another great day. In the first race we started badly and had to catch up, however in the next one we were precise and collected our first victory. We don’t have any particular strategy for tomorrow’s final races. With seven points of advantage and a fifth place discarded, we don’t feel under pressure. So, we will keep taking one day at a time and concentrate to give our best,” said Andrea Racchelli. Lenny (EST) has climbed to the second position overall after scoring a fourth and a third. “This is our first regatta in six months. We last raced in September and we are surprised how well we’re doing. We came here to have fun but since we’re on top of the chart, our appetites have increased,” said Toniste brothers, ready for tomorrow’s merciless finale. The battle will be particularly intense for the third place, as Storm Capital Racing (NOR) and Audi team (ITA) are only a point apart. “The wind was quite light and changing a lot so it was very hard to read. I’m glad we are still in the game for the podium because the boat returned from Australia only recently and its settings are not optimal yet,” commented Riccardo Simoneschi. The fleet will continue with three scheduled races on Sunday.